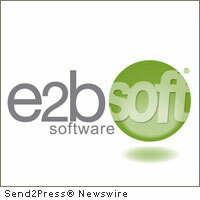 CHARDON, Ohio, July 12, 2011 (SEND2PRESS NEWSWIRE) — e2b software (www.e2bsoft.com), a business software developer, has been named a Sage Gold Development Partner of the Year for 2011. e2b software provides e2b 500 supply chain product extensions and Anytime Collect credit and collections software for Sage ERP MAS 500. In its first year, the Sage Development Partner Awards honors development partners who have best demonstrated a solid understanding and strong overall commitment to Sage customers. Sage recognizes e2b software and all development partners for extending the Sage customer experience through well-designed and easy-to-use product extensions. Recognition as a Sage Gold Development Partner of the Year is based on a partner’s ability to successfully deliver solutions that best fit customer and market needs; actively assist the Sage channel in closing new solution sales; significantly help Sage with customer retention; and maintain a solid reputation for customer satisfaction. Winners were presented at the Sage Summit 2011 Conference on July 11, 2011 at the Gaylord National Hotel and Convention Center in Washington D.C. e2b software is exhibiting at the annual Sage customer and partner conference in Booth #818 through July 13.
e2b software (www.e2bsoft.com) develops, sells, and supports on-demand, SaaS and on-premise business applications including Anytime Collect credit and collections management (CCM) and e2b 500 for Sage MAS 500 ERP. Anytime Collect (www.anytimecollect.com) is a suite of financial productivity solutions integrated with popular accounting systems to streamline and automate business-to-business accounts receivable collections activities resulting in significant reductions in outstanding receivables, and improved cash forecasting. e2b 500 products extend Sage ERP MAS 500 with functional improvements to inventory and manufacturing with new modules to manage supply, demand, operations, planning, and product costing. Custom software development and consulting services are provided through resellers and consultants nationwide. – e2b RSS newsfeed: https://send2pressnewswire.com/author/e2b-software/feed .